Louis James Abbott was a son of Henry White Abbott, a boiler maker born in 1855 at Old Fletton, Huntingdonshire, and Betsy O. Abbott, who was born in 1859 in Cambridgeshire. Louis was born in 1899 in Grantham, and baptised on the 3rd May, 1891, in St Wulframs, Grantham. At the Census of 1891, Henry and Betsy Abbott lived on Stanton Street, Grantham, where they had five children, Harry (b.1881), Lily (b.1883), George (b.1886), Louis James (b.1889) and an un-named daughter less than a year old, as well as a nurse named Ann Swain, a 61 year old widow from Harlaxton. Their whereabouts in 1901 has not been found, though Louis received a mention in the Grantham Journal of the 23rd January, 1904, in a report of the Grantham Industrial and Fine Art Exhibition, where he was listed as coming third in Class 14 for ‘Six Elementary Designs in Brush Work’, “Louis J. Abbott, Grantham Boys Upper School“. By the census of 1911, Louis James Abbott was living with his wife Edith Elizabeth (nee Smith, b.1888 in Derby) at 17 East Street, Grantham. The couple had only recently got married, on the 7th January, 1911. At this time they lived at Retford Cottages, Chapel Street, Bottesford (the service record gives the address as Bedford Cottage, but this is clearly a clerical error). 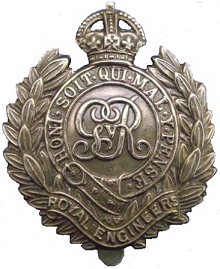 Louis James Abbott joined up on the 23rd November 1915 at Warminster, Wiltshire, attested as Sapper 107527 Royal Engineers and was graded as ‘Painter Superior’ all on the same day. His address at this time was 111 Bradley Street, Warminster, his age 26 years 5 months, height 6 feet, profession a decorator. He had previously served in the 4th Battalion, Lincoln Territorial Regiment but had left in 1908. The couple had moved to Warminster, presumably to find work. The service record names three children: Louis James George (born on the 14th June 1911 in the Grantham district, at Bottesford), Joan (b.2nd August 1915 at Warminster), and Nora Rosemary (b.17th August 1918 in the Grantham district i.e. at Bottesford). His records give little detail about his service, though they do record that he was ‘awarded’ 14 days detention for drunkenness on the 1st May 1916, and was also ‘severely reprimanded’ on the 25th February 1818 (though his offense in uncertain). He arrived in France on the 7th July 1916, which is where he is thought to have spent much of the war, though his ‘Protection Certificate and Certificate of Identity’ states that he served in the Eastern Theatre. After the end of the war, he was transferred to No.3 Dispersal Unit at Clipstone Camp on the 29th January 1919, and was presumably discharged soon after. After his demobilisation, Louis and Edith lived in Retford’s Cottages, a terraced yard of cottages, since demolished, on the northern side of Chapel Street. They moved to a house on Belvoir Road, where they stayed through the 1920s. Later, they moved to Queen Street, and in 1939 gave their address as a house on Queen Street called ‘Southbourne’. They also lived in a house which adjoined the old Co-op store, both demolished before the present Co-op was built in the 1960s. Louis was well known in the Bottesford area as a skilled painter, decorator and sign-writer. He was listed as such in Kelly’s Directory of Leicestershire in 1928 and 1932. Louis is remembered as a lay preacher in the local Methodist circuit. Mr John Simpson recalled that: “Mr Abbot had served as a soldier in WW1- France where he was injured by ‘Mustard Gas’ and invalided home, always, thereafter to suffer from the damage to his lungs“. Mr Simpson described finding a c.1918 German electric torch in Louis’ old harmonium after he died, presumably a ‘souvenir’ from the trenches. Louis Abbott died in the Melton Mowbray district in 1973, aged 84. John Francis Tufnell Barrett, D.S.O. and bar, D.F.C.